There is a seemingly endless variety of images and displays that provide amusing and perhaps unexpected insights into the complex workings of the visual system. There are scores of Internet sites dedicated to visual illusions and other visual phenomena. To my mind, two are way ahead of the rest: the one is Michael Bach's beautifully exposed and carefully explained exhibition , the other is the annual illusion contest arranged by the Neural Correlate Society . The present page has less serious ambitions and aims primarily to provide a few minutes of visual distractions. Move the cursor over the image to the right to start a seesawing "eye" movement. Look at the eyes for a while to see how their directions of movement may appear to change. Vertical movement may dominate but some-times the direction appears to change to horizontal or even oblique. Move the cursor away from the image to stop movement. It may take a while to perceive the variations in the Necker Cube orientations, presumably because the figure contains several intersecting lines. Variations may be easier to see in a figure lacking intersecting lines, like the half-open book-like figure below. Look at the vertical center line to see how the view changes from inside to outside and back again . The peculiar object shown to the right has a peculiar property: it appears to change both size and brightness with a change in viewing distance - try rocking back and forth a couple of times. Familiar objects like a pencil or an eraser do not change their appearance with a change in distance, of course, due to the so-called size and brightness constancy effects. The constancy mechanisms can be defeated by blurring the outlines and introducing a brightness gradient. The radiating spokes enhance the effect. Originally named the Dynamic Luminance-Gradient Illusion and the Breathing Light Illusion by the discoverers, S Gori and DA Stubbs , the illusion has also been called the "here comes the sun effect". My rendition is quite simplistic compared to those presented in the cited reference. Breath-taking color renditions can be viewed at . Look at the lilac blob for a little while. Then slide the cursor over the blob to make it shrink in size. This smaller blob will appear to be surrounded by a greenish halo. The halo is a complementary after-image of outstanding clarity. 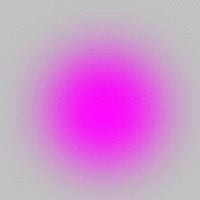 This is a static variant of Hinton's animated Lilac Chaser Illusion. For another peculiar aspect of afterimages, see the super-resolution section [A]. On a cursory glance the panel below may appear to show no more than a faint, slightly irregular pattern. On a closer look, it can be seen to consist of a perfectly regular sawtooth pattern, as shown in the magnified section to the right. However, the sawtooth pattern can be clearly seen within a restricted oval area only and this area moves with a change of gaze direction. It may be useful to cover one eye and to vary the viewing distance slightly to bring out the roaming fovea phenomenon with maximum clarity. The explanation is that the sawtooth's dimensions and contrast are above threshold for the fovea and below threshold for the extrafoveal retina. The following diversion needs to be viewed on a regular PC screen. It does not work on smaller screens. The panel below represents an opposite to the one above. On looking around, the panel may appear to show no more than randomly scrambled squares: it is quite difficult to see that there is an embedded figure. This is because foveal vision is geared for fine detail. The opposite is true for peripheral vision and it may be possible to see the figure in peripheral vision while reading this text. Another way to uncover the figure is to obscure fine detail by squeezing the eyes nearly completely shut, to achieve so-called "low-pass spatial frequency filtering". Yet another way is to blur the image, e g, with optical over-correction. Perhaps paradoxically, subjects with impaired vision should find detection easier. It follows that it might be possible to make a "reversed" vision test, where it would take abnormal vision to identify test symbols [key]. This diversion can be seen in binocular vision only. Hold both hands as shown in the figure below, at a reading distance. Fixate on a distant object in line with the gap between the index fingers. The gap will then appear to be filled-in by a sausage-like shape. Quite unusual for sausages, this one carries a finger-nail at each end. Move the cursor over the figure to see the flying sausage phenomenon illustrated. A dramatic way to visualize the blindspot is by popping, i e, causing filling-in by overlapping the optic disc border with a ring-shaped target . Such a display is presented elsewhere on this site. Popping is quite striking but requires a precise positioning. The new dynamic display presented below is more robust (but still requires quite precise positioning, and a stable fixation). Begin by covering the left eye. Then, find a fixation point about 15° to the left of the center of the black spot swarm, at the same height as the upper spots. 15° corresponds to ca. one-quarter of the viewing distance (110 mm at 400 mm (4½" at 16")). With small computer screens, use an object situated to the left of the screen. A graduated ruler facilitates identification of the optimum point of fixation. The optimum point of fixation is that point that when steadily fixated makes the four black spots disappear from view. Try to center the spots precisely inside the blindspot borders by making small adjustments of the viewing distance. When done, continue looking at the fixed fixation point and slide the cursor across the image frame. The spot pattern will then periodically expand to overlap the blindspot margins. In the expanded position, the blindspot can be seen to fill-in the space between the spots, as shown in the miniature image below. Move the cursor outside the image frame to stop movement. The reason for using a dynamic pattern is to evade the Troxler fade-from-view effect. In case of difficulties in the initial hiding of the spots, the viewing distance may need to be increased slightly. Conversely, if the expanded pattern cannot be seen, the viewing distance needs to be decreased. Incidentally, it is often said that the discoverer of the blindspot, the French naturalist Edme Mariotte (1620-1684, ), amused the English court by teaching the king and the courtiers (and the courtesans?) how they could "behead" an adversary by covering one eye and then fixating to the adversary's side so as to hide his or her head in the observer's blindspot. Factual confirmation is lacking and the little anecdote has actually been attributed to a faulty translation of Royal Society, shifting the venue from the learned English institution to the royal court. A more practicable way to demonstrate "beheading" is to hold both hands as shown to the right, with extended arms. Close the left eye and look at the tip of the left index finger. The tip of the right index finger will then disappear from view (slight variations of finger separations may be needed). The question why the retinal vessels don't throw a visible shadow on the sensory retina is highly legitimate but it is also a trick question. Of course, the vessels must throw a shadow but the retina does not care about stationary images and therefore does not pass the shadow image upstream. To see the vascular shadow, the shadow must move over the photoreceptors, at a rate that is higher than their rate of adaptation. A simple way to produce a shadow movement is to look at a uniformly lit surface through a continually moving pinhole aperture. A uniformly luminous surface can be obtained by tapping the Blank Screen button below. A pinhole aperture can easily be improvised by punching a small hole in a piece of cardboard. Remove any spectacles and cover one eye. Look through the pinhole at the screen while moving the pinhole a few millimeters in the frontal plane, in a linear or circular fashion. For best results, the pinhole should have a diameter of about 2 mm, it should be positioned very close to the eye, and and it should be jiggled as fast as possible. Proper handling is facilitated by cutting the cardboard to a circular shape, with a diameter of about 30 mm. A pinhole offers a fairly small field of view, so don't expect to see the same view as in the photograph above. 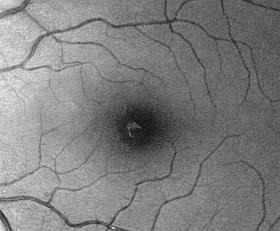 A wider field can be obtained by extending the pinhole to a narrow slit but for really striking views of the retinal vasculature, it is better to shine a bright and well-focused light from an ophthalmoscope or a slitlamp onto the sclera, in a dark room. Again, movement is necessary. Apropos movement, its direction is largely immaterial for viewing vessels, but there is another entoptoscopic (meaning "seeing the interior of the eye") phenomenon that can be seen only with a circular movement, namely, the foveal granular pattern. The latter is much fainter than the vascular shadows and also limited to the fovea, where vessels are lacking. It is thought to be due to a moiré effect arising from intra-retinal structures . The discovery of entoptoscopy of the retinal vascular tree is attributed to the Czech physiologist Jan Evangelista Purkinje (1787-1869) and the phenomenon is often named the Purkinje Vascular Tree. Using a moving candle as a light source, Purkinje must have been a very keen observer - seeing the vascular tree his way is very difficult indeed. ArtFoco of Belo Horizonte, Brazil, has found a novel way to enhance interest in acuity testing. The new chart seems to cater primarily to males. It is protected by copyright but a one-line teaser might be permissible. The full chart can be purchased from Coloribus (no affiliation). It is not known whether charts geared for other genders are in the pipeline. Imagine spinning the image to the right around the center dot. 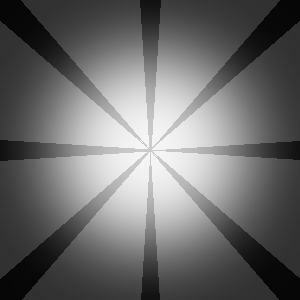 At a high enough rate of rotation, the chord lines obviously will blur out but another, stationary pattern will appear. It may be amusing to try to predict the pattern. Unfortunately, some browsers cannot render high-speed rotation so multiple static overlays will have to do. Move the mouse to the image to see a simulated rotation effect. This an adaption of an old-time cut-out-and-paste party trick. The original source is unknown. P Aydin and M Muftuoglu noted highly significant gender discrepancies - the reflex was much less commonly seen in men than in women. This was thought to reflect a tendency among males "to show rather than to cover". The finding among women of a decreasing frequency with increasing age was attributed to "what is left to be covered" . The doglick reflex consists in stereotyped forced eyelid closure plus a variable activation of the risorius muscles, sometimes combined with forced lip closure and/or vocal protestations. 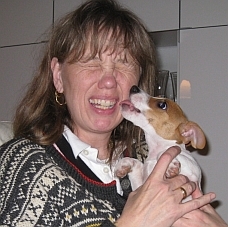 The reflex is reliably elicited by an affectionate canine lick at the subject's corner of the mouth. Although frequently observed in daily life , little is known as yet about the effects of pathological states on the reflex's characteristics. Important clinical applications can be foreseen within the field of æsthetic medicine, e g, to assess the outcomes of botulinum injections and facelift surgery. For reference, a standard canine (with a standardized fœtor ex ore) should be kept under constant temperature and pressure at the International Bureau of Weight and Measure in Paris, France (BIPM). The panel shows the effect of flashing some measly white dots on to a regular checkerboard: the dots introduce quite pronounced distorsions. This illusion is termed Kitaoka's checkerboard. Peculiarly, the addition of black dots to the white squares does not have the same effect. Akiyoshi Kitaoka's Illusion Pages are well worth visiting. Rumour has it that this motorbike was designed by an orthopædic surgeon. So, the gauntlet has been thrown down: what can be done by other specialists? Any neuro-ophthalmology takers? 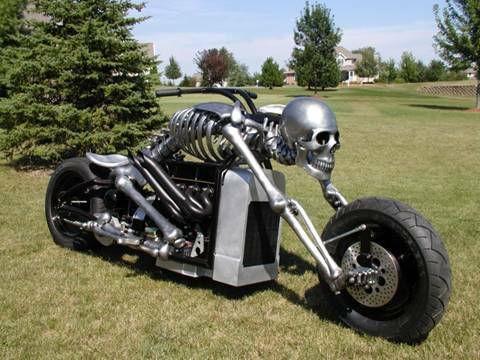 Additional photos of the "Skeletor bike" can be found on many Internet sites. Thanks to Pinar Aydin O'Dwyer, MD,  for setting me on this track. 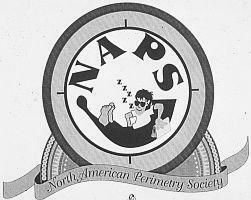 The North American Perimetry Society (NAPS) clearly acknowledges the fact that many practitioners find visual fields utterly boring. The meetings of the society are quite different: they belong to the very best I have ever attended. Contact Bal Chauhan or Chris A Johnson for information on the next meeting. There is no homepage.